Imagery of black cats is pervasive throughout western cultures and usually it’s incredibly negative. Edgar Allen Poe wrote a short story entitled “The Black Cat” and it’s unsettling to say the least. Even when it seems we’re celebrating black cats, they’re often associated with dark magic or witches wearing pointy hats riding on broomsticks. Black cats are often depicted with their backs arched in fear, as in Halloween decorations. 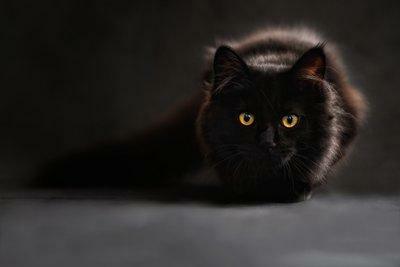 Where did these stereotypes and superstitions come from and what are black cats really like? Firstly, it must be said that black cats aren’t feared in all cultures by any means. Rather, the idea that black cats bring bad luck is distinctly European and has its origins from the Middle Ages. This idea intensified with the witchcraft paranoia in the sixteenth century when women were frequently accused of practicing the craft without a chance of redemption and often burned at the stake. Despite that ugliness, there is something to be said for superstition and its role in human psychology. Still, black cats shouldn’t suffer for the human desire to avoid superstition! Do they mostly suffer in terms of image or more tangibly? There has been some controversy about the supposed dangers that black cats face in terms of Halloween time or even the higher euthanasia rates compared to other cats. According to Catster, the fears surrounding the abuse of black cats around Halloween are probably overblown. Still, being cautious with your black cat certainly won’t do any harm. However, as pointed out in the aforementioned Catster article, It might be problematic to limit adoptions of black cats for such fears. That’s enough sadness and speculation. Let’s get to know black cats. What are they like? They’re like every other cat, if you dare to generalize their diverse personalities: playful but refined, loving but independent, and perfect for you! Black cats often come with a discount or rebate meant to counteract any perceived difficulty with adopting them out, which might be even more appealing to your wallet. On top of that, according to The Independent , eleven out of seventeen cat species have black coats, “proving that sable fur is most definitely advantageous for a feline.” Above all, black cats are survivors and have stood the test of time. Maybe we could learn a thing or two from them. Black cats have also been prevalent across the big screen and television. To fall in line with the stereotype, and possibly the most notable famous black cat, is Salem from “Sabrina the Teenage Witch.” The snarky black cat was well known for his jokes and quick comebacks. Another well-known, and well-loved, black cat is Sylvester from the “Looney Tunes” who is recognizable for his constant chase after the little, yellow Tweety Bird and his iconic lisp. Did you also know about the black cat named Blackie? He is actually the world richest cat when he was given his owners inheritance of $12.5 million in 1988, according to the Guinness World Records. The owner also donated large portions of his fortune to three cat-based charities. If you’re interested in adopting a black cat, be sure to contact your local shelter today. Pay extra, special attention to your furbaby throughout the month of October and be sure to bring in your mysterious creature of folklore for a complete checkup. Better yet, invest in a Wellness Plan to protect their long-term health. You can call (703) 378-9791 to set up your appointment today!